Steeda's Pro-Action Ultra-Lite Lowering kits pair our Steeda Ultra-Lite Springs with matched Pro-Action Shocks and Struts in one complete package. 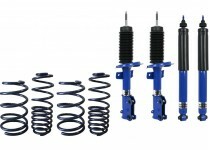 When lowering your 2005-2014 Mustang GT it makes both performance and financial sense to change the springs, shocks and struts together. From a performance standpoint our Pro-Action shocks and struts are far superior to the factory units at properly controlling the higher spring rates of our lowering springs providing improved ride quality and control. With the front springs mounted directly on the strut which has to be removed for installation, it makes financial sense to do the springs, struts and shocks at the same time, saving you on labor costs. 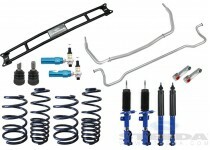 Do the job right once and save money with our Pro-Action Sport Lowering Kits. Note: Springs will lower your Mustang 1 1/4" in the front and 1 1/2" in the rear. Steeda's Pro-Action Sport Lowering kits pair our Steeda Sport Springs with matched Pro-Action Shocks and Struts in one complete package. When lowering your 2005-2014 Mustang GT it makes both performance and financial sense to change the springs, shocks and struts together. From a performance standpoint our Pro-Action shocks and struts are far superior to the factory units at properly controlling the higher spring rates of our lowering springs providing improved ride quality and control. With the front springs mounted directly on the strut which has to be removed for installation, it makes financial sense to do the springs, struts and shocks at the same time, saving you on labor costs. 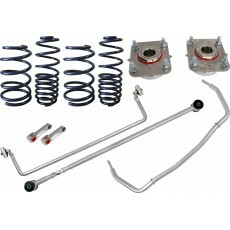 Do the job right once and save money with our Pro-Action Sport Lowering Kits. Note: Springs will lower your Mustang 1" in the front and 1 1/4" in the rear. As good as Ford made the Boss 302 Mustang, there is still room for improvement to make your Boss even better than it already is with our handling packages. Level 1 includes our Boss 302 specific springs, adjustable upper strut mounts, and our adjustable panhard bar. 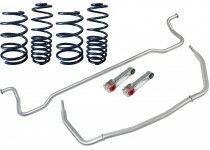 The springs in this package greatly improve the Boss 302's overall weight distribution. This is achieved by lowering the ride height only 0.2 inches in the front, but the rear comes down 0.7 to 0.8 inches. 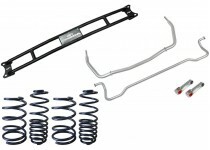 Steeda's Sport Spring & Swaybar Package is an excellent basic upgrade for your 2011+ Mustang that will greatly improve steering response, reduce body roll, and improve handling balance while maintaining excellent ride quality. Includes our famous Steeda Sport Springs which lower the vehicle 1" in front and 1 1/4" in the rear along with a 2011+ Mustang specific swaybar package. 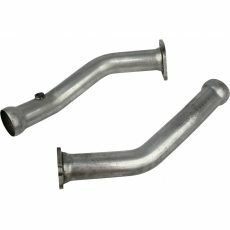 The adjustable tubular front swaybar of our package is 3 position adjustable and provides up to a 15% increase in roll stiffness. Our rear swaybar is a 1" solid bar with billet endlinks and urethane bushings providing a 25% increase in roll stiffness. This package gives you Steeda's proven suspension components in one proven system that combined will improve cornering grip, handling balance, reduce brake dive, reduce body roll and stiffen the front chassis of the vehicle which is one of the few area's in the chassis that needs extra bracing. Steeda handling pack will also lower the vehicle about 1 inch in the front and 1 1/4 in the rear for a great appearance and improved weight distribution. The Steeda Autosports Engineering Team latest creation is the most technologically advanced and best performing suspension upgrade you can provide for your 2005 and newer Mustang. Steeda’s Watt’s Linkage was under development for an extended period of time by Steeda Engineers using ISO 9001-2008 certified procedures to insure we set a new benchmark standard for Watt’s Linkage suspension systems for the Ford performance enthusiast. Our Steeda Pro Action Handling Package put together the most commonly purchased suspension upgrades into one package system that combined will improve cornering grip, handling balance, reduce brake dive, reduce body roll while providing a cost savings when purchased as a package. Ride quality remains excellent compared to stock with race car like handling and control. This handling package will dramatically reduce understeer and produce more neutral balance without reducing suspension compliance. The Pro Action Suspension Package will lower the vehicle about 1 inch in the front and 1 1/4 in the rear with our sport springs and 1 1/4 in the front and 1 1/2 in the rear with our Ultra-Lite springs. As good as Ford made the Boss 302 Mustang, there is still room for improvement to make your Boss even better than it already is with our handling packages. Our Level 2 package includes our Boss 302 specific springs, adjustable upper strut mounts, adjustable panhard bar, and adjustable front and rear swaybars. Steeda's Stage 3 handling package gives you Steeda's proven suspension components in one proven system that combined will improve cornering grip, handling balance, reduce brake dive, reduce body roll and stiffen the front chassis of the vehicle which is one of the few area's in the chassis that needs extra bracing. Ride quality remains excellent compared to stock with race car like handling and control. 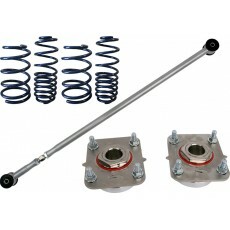 This package will dramatically reduce understeer and produce more neutral balance without reducing suspension compliance. Compared to Stage 2, front end steering response is improved further and front suspension geometry is revised and corrected. This package will lower the vehicle about 1 inch in the front and 1 1/4 in the rear for a great appearance and improved weight distribution.